A place for code snippets, thoughts, theory, practice, learning, and review. Improper Syntax… having used so many similar and diverse languages, I find myself often mixing and matching syntaxes together. Is it MyArray.Count or MyArray.Items() or Size(MyArray) … ? This personal shortcoming invigorates my love for Ruby, where, no matter which way you are used to counting the size of an array, using ToString(), etc, etc, it all works just fine. But, that is a whole new blog post. 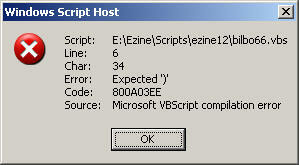 Ahh, nothing like a good syntax error message to start off your day.